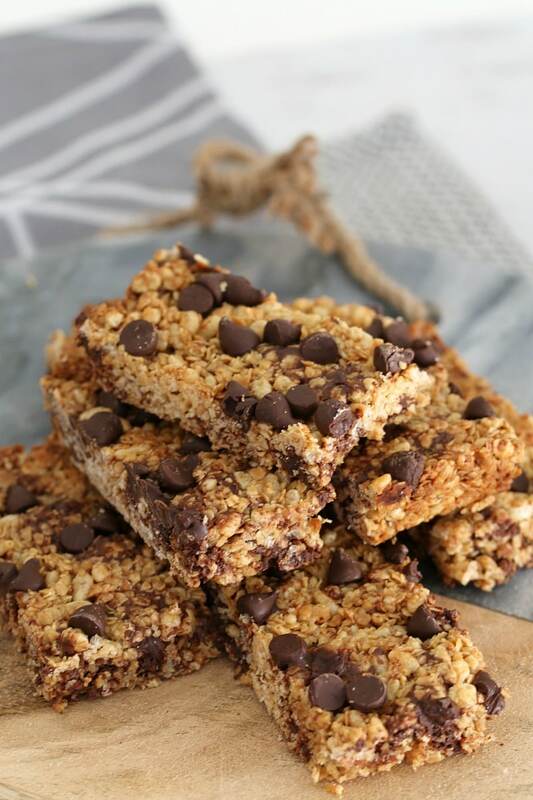 Perfectly easy chocolate chip muesli bars that take only 10 minutes to prepare (and even less time to eat!!). These are a winner with the whole family! I’m a big, big fan of muesli bars. Back when I was teaching (which seems like a zillion years ago… but was only a couple! 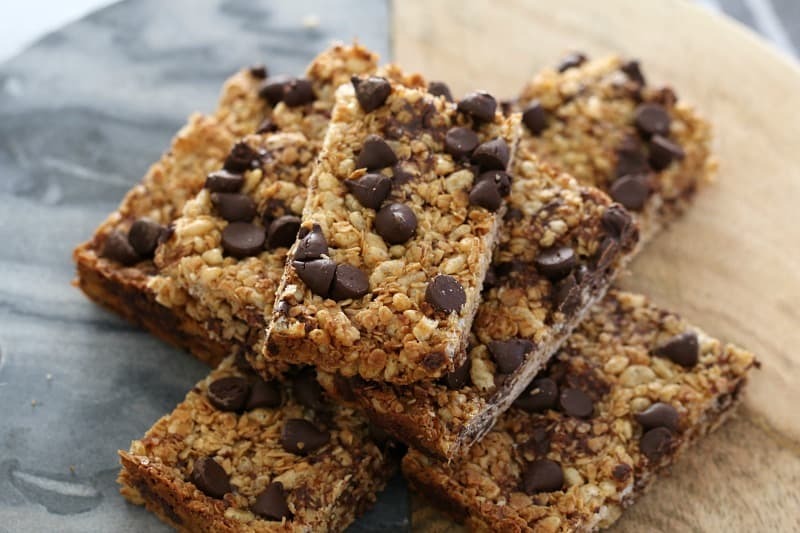 ), I would always have a muesli bar in my handbag for a quick and easy snack at recess time (and if I’m being honest, sometimes during class time too!). If I was really super organised at the time (aka… if it was the start of a term), I would always have homemade muesli bars. BUT if it were later in the term, it was store-bought all the way. Anyway, now that I’m a ‘work-at-home-mum’ (is that the correct name for it!!? ), I make my own muesli bars a lot. It’s so much cheaper… plus I don’t have the craziness of school reports, excursions etc, to think about anymore! Mind you, I do have a 1 year old – and that’s surely the same thing!!!!! 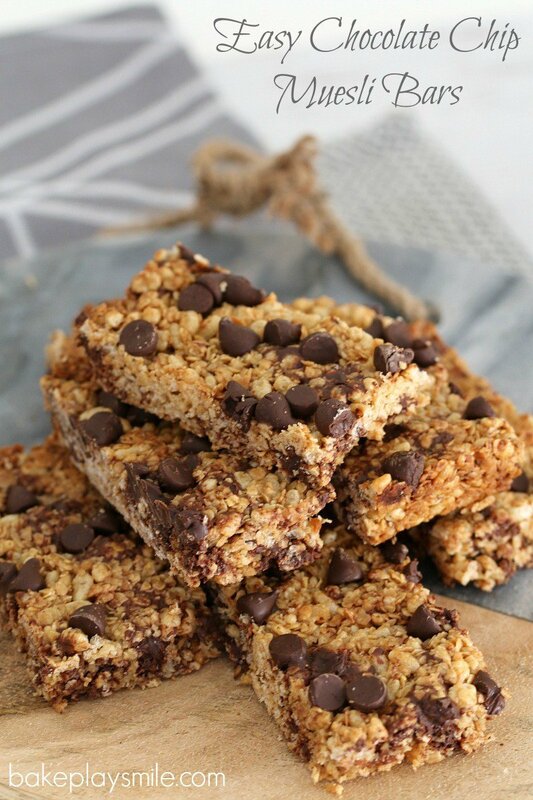 But back to these super easy chocolate chip muesli bars! Now when I say that they’re easy, I’m talking really, reeeeeealllly easy. As in, just melt, mix and bake. That. Is. It! Haha, that’s also about my mental capacity right now too. I certainly haven’t created anything fancy or new here. 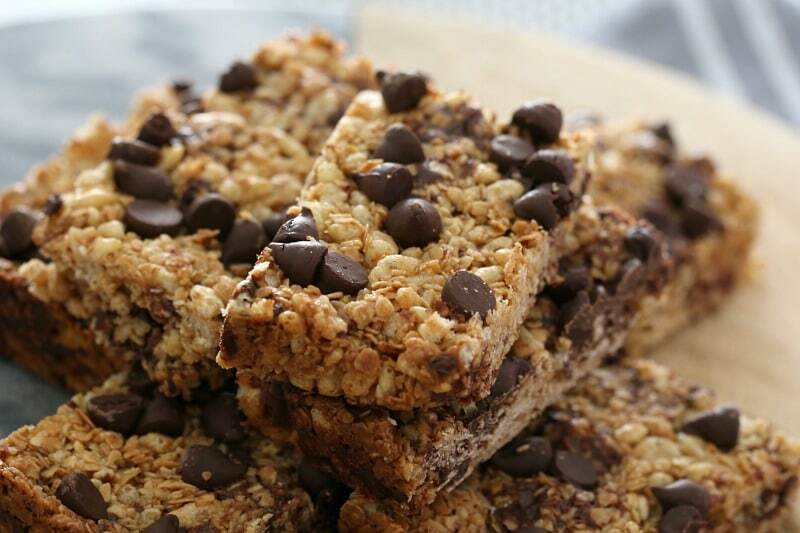 These are just good old fashioned baked muesli bars – with chocolate chips (of course!). If you’re super clever, you might notice that in the recipe I use quick oats, rather than rolled oats. You can absolutely 100% use rolled oats if that’s what you’ve got in the cupboard (please, please don’t make a special trip to the supermarket!). 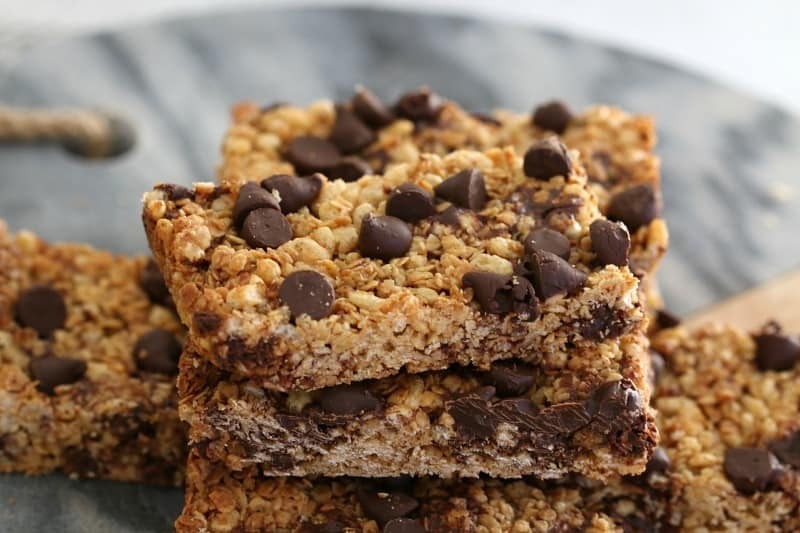 I just like the quick oats because I find that they make the muesli bars easier to cut into nice, neat slices… but we’re not all crazy neat-freaks like me, are we!!?? Oh and did I mention that these are also egg-free (and dairy-free if you use dairy-free chocolate chips). 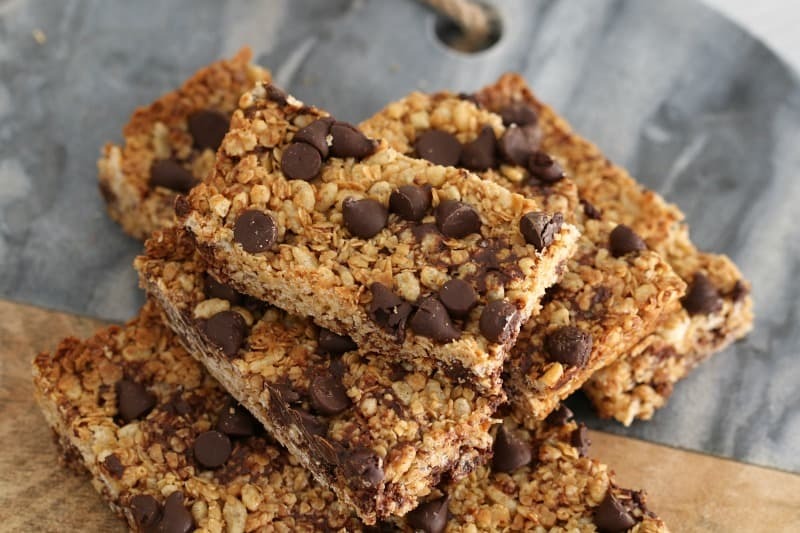 That’s not really a big deal in our house, but if you’re catering for allergies – these easy chocolate chip muesli bars are a great place to start. PS. 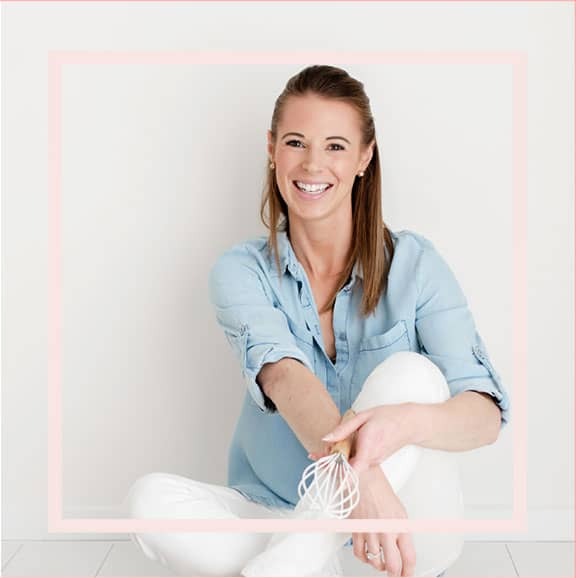 If you’d like some more muesli bar recipes, check out my healthy and homemade muesli bars and my honey but muesli bars too. Preheat oven to 170 degrees (fan-forced). Grease and line a 20X30cm rectangular slice tin and set aside. Place the coconut oil, brown sugar, honey, vanilla extract and salt into a saucepan and stir over a medium heat until melted and slightly thickened (alternatively, you can heat this mixture in the microwave). Add the quick oats and rice bubbles and stir through. Allow the mixture to cool then stir through 1/2 cup of the chocolate chips. Press the mixture firmly into the prepared tin. Sprinkle the remaining chocolate chips over the top and press down. Bake in the oven for 20 minutes or until lightly golden. Cook in the tin for 10 minutes before transferring to a wire rack to cool completely (the muesli bars will go crunchy once cooled). Cut into slices and store in an airtight container in the fridge (see notes). 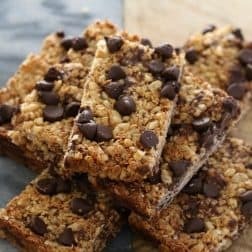 Rolled oats can be used instead of quick oats - I just found that it's easier to cut the muesli bars when they've been made with quick oats. Storing the muesli bars in the fridge will keep them extra crunchy (you can keep them at room temperature though!). 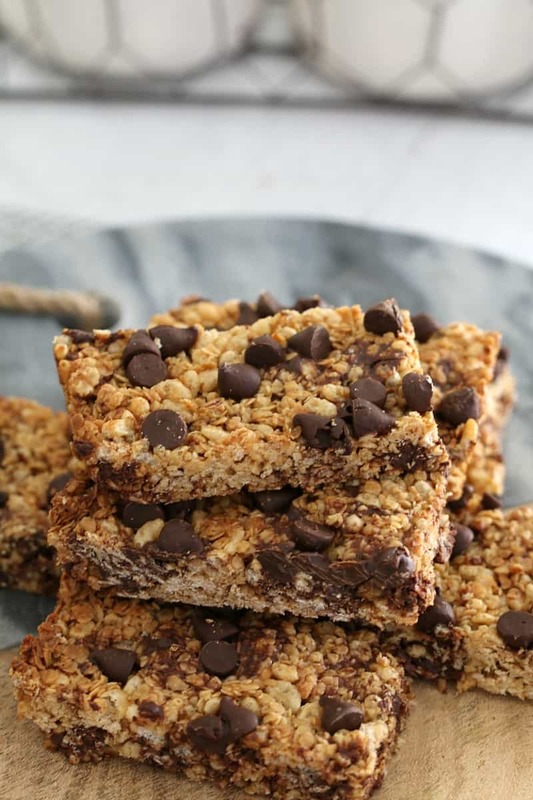 Perfectly easy Thermomix chocolate chip muesli bars that take only 10 minutes to prepare (and even less time to eat!!). These are a winner with the whole family! Place the coconut oil, brown sugar, honey, vanilla extract and salt into the TM bowl and mix on Speed 3, 90 degrees, 4 minutes. Add the quick oats and rice bubbles and mix on Reverse, Speed 2 (using the spatula to assist), until combined. Yay! That’s awesome! So glad you liked them… and that is super efficient making them before preschool! really yummy, I used rice malt syrup instead of honey.